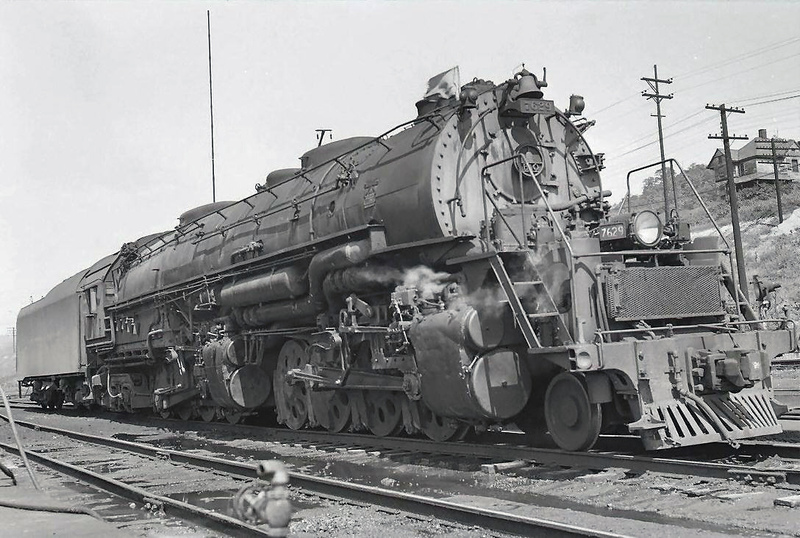 While the Baltimore & Ohio’s Class EM-1 2-8-8-4s were not the most powerful of the large designs built during steam's twilight in the 1930s and 1940s they were nevertheless exceptionally built machines that in time became well-liked by train crews. Not only were the EM-1s capable of holding their own on steep grades with a coal drag in tow but also it was arguably one of the most aesthetically beautiful large steamers ever built. Ironically, had the B&O been able the railroad would never have purchased the design, instead opting for the new and efficient diesel locomotive. However, needing more power and wartime restrictions preventing it from purchasing diesels the B&O was forced to buy more steam. The 2-8-8-4s saw less than 20 years of service before their retirement and sadly, none were ever preserved. The B&O's EM-1 class was known as the Yellowstone design, which were first put into service on the Northern Pacific in 1928. The NP wanted a powerful articulated (meaning that either one, or both sets of the locomotive's driving wheels pivots to better and more safely negotiate curves) that could not only move heavy freights through the Northern Plains of the Dakotas but also at relatively quickly. 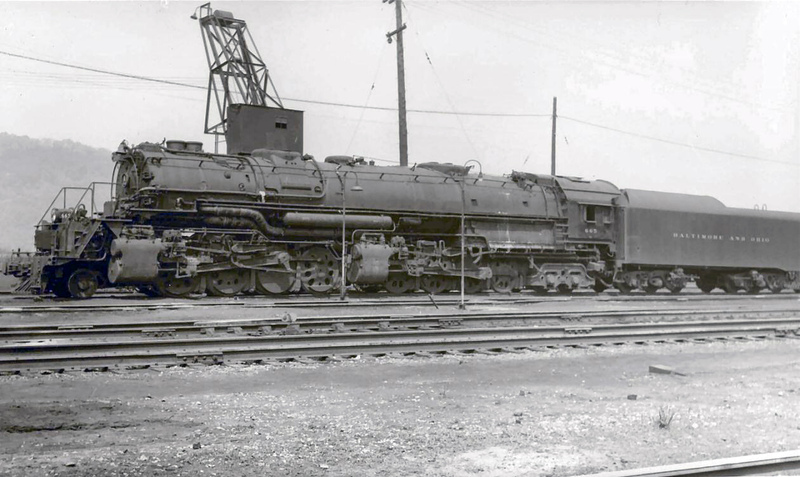 Ultimately, however, only two other lines aside from the B&O (which as the last to buy the 2-8-8-4) purchased Yellowstones; the Missabe Road (DM&IR) acquired 18 (Class M-3/M-4) in 1941 to pull heavy ore trains and Southern Pacific picked up 12 in 1939 (Class AC-9). The EM-1 was developed during the very end of the steam era and accordingly would carry the latest technology available. Thirty of these locomotives would be built, all coming from the Baldwin Locomotive Works, and were delivered to the B&O towards the end of World War II between 1944 and 1945. The eastern trunk line was one of the first to embrace diesel technology purchasing a boxcab switcher from Alco and Ingersoll-Rand in 1924 and then testing Electro-Motive's streamlined EA in 1935. The railroad desperately wished to continue purchasing diesels (then EMC's FT model) to keep up with wartime traffic. 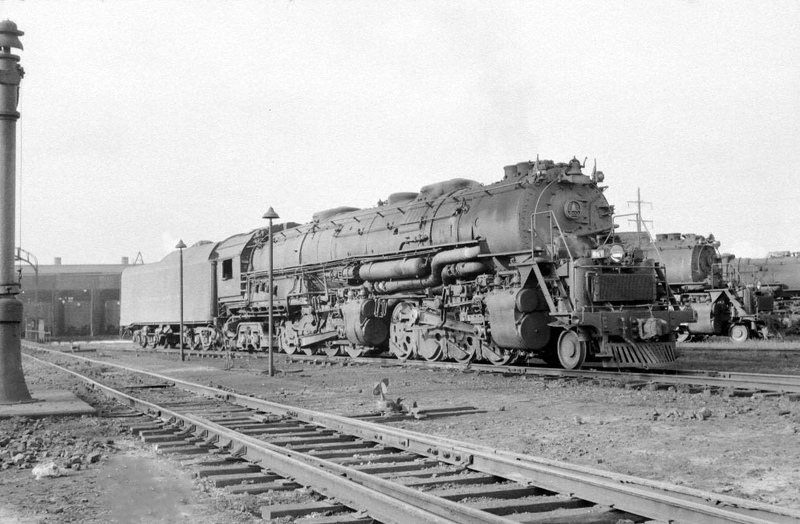 However, with restrictions in place the B&O was forced to settle buying more steam, settling on the Yellowstone design. The EM-1s had a rather low boiler pressure comparative to other models in its class but this low pressure had a great benefit, a high factor of adhesion (4.22). This high ratio allowed the locomotive to start rather efficiently in that it was not as susceptible to wheel slippage as other designs. For instance, this added incentive was an extra benefit in the type of service the B&O originally designated the EM-1, the torturous grades of the railroad’s West End (its Cumberland and Pittsburgh Divisions), through the Appalachians. The locomotive did a marvelous job, having little trouble hauling merchandise or coal drags over the steep climbs of Cranberry Grade, along the West Virginia/Maryland border, or over Sand Patch in Pennsylvania. In time, the railroad actually became rather fond of its 2-8-8-4s. The EM-1 was a true sight to behold if one was lucky enough to witness it trackside at work. A classic example is the locomotive working upgrade over Sand Patch. The engine exemplified what made the steam locomotive such an admired and respected machine, even outside the railroad and railfan community. The pure power and deafening sound by a locomotive of the EM-1’s size is perhaps something words, pictures and maybe even videos can never truly replicate without the fortune of being there in person to witness such for yourself. While the size of the EM-1 is enough in itself to instill awe, seeing it in person illustrates the point that much more. The below specifications of the locomotive are courtesy of John Patton. Cylinders: Diameter x Stroke (4) - 24" x 32"
According to John Patton, "the EM-1s were said to be easy steamers to operate and crews liked them. With minor stay bolt trouble they were perfect for the B&O in every way possible. As said upon delivery by head of machinery, they had everything, all wheels had roller bearings and were top of the line for steam on the B&O...these B&O articulateds were 1,010,700 pounds, laden; carried 22,000 gallons of water and 25 tons of coal." The EM-1 would be short-lived, however. By the late 1950s the locomotives had been renumbered to make room for new diesels that the B&O could finally purchase after the war had ended, and the EM-1 was shifted from the mountain regions to the Ohio River and the railroad’s Pittsburgh Division. 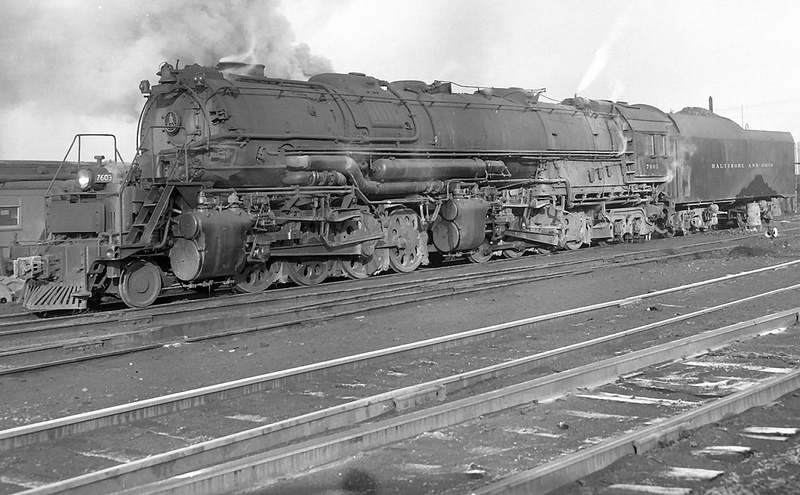 This time period also spelled the end for steam itself throughout the nation’s railroads. After less than twenty years of service (in steam locomotive years this is very young) the final EM-1 was dropped from the roster around 1960. However, according to Mr. Patton, "the last one off the roster was to be saved for the B&O Museum in Baltimore, but it never happened due to lack of funding and the museum not being open to try an reserve funding for such." Unfortunately for both railfan and historian alike, not one EM-1 is preserved for future generations to tour and see.